My recent inter­view about the Ger­man domest­ic spy agency, the BfV — the Office for the Pro­tec­tion of the Con­sti­tu­tion, iron­ic­ally — being allegedly infilt­rated by ISIS. ISIS Agent in Ger­man Spy Agency from Annie Machon on Vimeo. 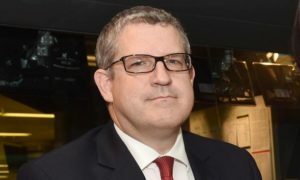 For the first time a serving head of a major intel­li­gence ser­vice in the UK, Andrew Park­er the Dir­ect­or Gen­er­al of the UK domest­ic Secur­ity Ser­vice, has giv­en an inter­view to a nation­al news­pa­per. Inter­est­ingly, he gave this inter­view to The Guard­i­an, the paper that has won awards for pub­lish­ing a num­ber of the Edward Snowden dis­clos­ures about endem­ic illeg­al spy­ing and, for its pains, had its com­puters ritu­ally smashed up by the powers that be. The tim­ing was also inter­est­ing — only two weeks ago the Invest­ig­at­ory Powers Tribunal (the only leg­al body that can actu­ally invest­ig­ate alleg­a­tions of spy crime in the UK and which has so far been an unex­cep­tion­al cham­pi­on of their prob­ity) broke ranks to assert that the UK spies have been illeg­ally con­duct­ing mass sur­veil­lance for 17 years — from 1998 to 2015. This we could all deduce from the dis­clos­ures of a cer­tain Edward Snowden in 2013, but it’s good to have it offi­cially con­firmed. Yet at the same time the much-derided Invest­ig­at­ory Powers Bill has been oil­ing its way through the Par­lia­ment­ary sys­tem, with the cul­min­a­tion this week. This “Snoop­ers’ Charter”, as it is known, has been repeatedly and fer­vently rejec­ted for years. It has been ques­tioned in Par­lia­ment, chal­lenged in courts, and soundly con­demned by former intel­li­gence insiders, tech­nic­al experts, and civil liber­ties groups, yet it is the walk­ing dead of UK legis­la­tion — noth­ing will kill it. The Zom­bie keeps walk­ing. It will kill all notion of pri­vacy — and without pri­vacy we can­not freely write, speak, watch, read, activ­ate, or res­ist any­thing future gov­ern­ments choose to throw at us. Only recently I read an art­icle about the pos­sib­il­ity of Face­book assess­ing someone’s phys­ic­al or men­tal health — poten­tially lead­ing to all sorts of out­comes includ­ing get­ting a job or rent­ing a flat. And this dove­tails into the early Snowden dis­clos­ure of the pro­gramme PRISM — the com­pli­city of the inter­net mega­corps — as well as the secret back doors what were built into them. It will be the end of demo­cracy as we (sort of ) know it today. And, as we know from the Snowden dis­clos­ures, what hap­pens in the UK will impact not just Europe but the rest of the world. So how does this all link into the MI5 head honcho’s first live inter­view? Well, the tim­ing was inter­est­ing — ahead of the Invest­ig­at­ory Powers Bill passing oleagin­ously into law and with the ongo­ing demon­isa­tion of Rus­sia. 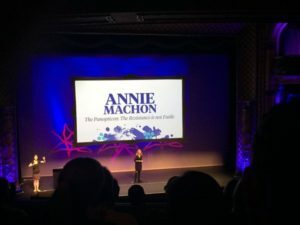 Com­ment­ary on MI5’s first nwspa­per inter­view from Annie Machon on Vimeo.